We’d love your help. 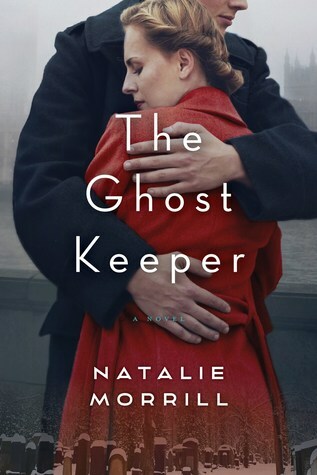 Let us know what’s wrong with this preview of The Ghost Keeper by Natalie Morrill. In the years between the two world wars, Josef Tobak builds a quiet life around his friendships, his beloved wife, Anna, and his devotion to the old Jewish cemeteries of Vie Winner of the HarperCollins/UBC Prize for Best New Fiction, this powerful, sweeping novel set in Vienna during the 1930s and ’40s centres on a poignant love story and a friendship that ends in betrayal. To ask other readers questions about The Ghost Keeper, please sign up. My local library system has a romance genre sticker on this book. And the cover definitely has that "I'm a romance novel" design about it. But "The Ghost Keeper" is not that. Yes, there is a romantic relationship, but the focus is more on questions of friendship and making the reader ask 'What would I have done?' in the situations of Morrill's well-drawn characters - some Jewish, some Gentile - amidst the horror of the Holocaust, Nazism and WWII. Would I have resisted? What would I have done to survive? What lines might I cross? What could I have withstood? If I survived, how would I be haunted? Who and what could I forgive? I look forward to reading more from Natalie Morrill. It’s hard to know where to start, with The Ghost Keeper. It’s not incorrect to say it’s a story about a man in Vienna, during the Second World War, who looks after the graveyards. But that’s not really the important part. It’s not the heart of the story. This is a story about relationships – about the bonds between families and friends. It’s about making hard choices, and how you live with the consequences after. Josef Tobak is a Jewish man, living in Vienna. And his story is very much about livi It’s hard to know where to start, with The Ghost Keeper. It’s not incorrect to say it’s a story about a man in Vienna, during the Second World War, who looks after the graveyards. But that’s not really the important part. It’s not the heart of the story. Josef Tobak is a Jewish man, living in Vienna. And his story is very much about living his life. He doesn’t necessarily begin or continue in chronological order, his memories jumping back and forth between the pages. But certain aspects stick out. How he meets and falls in love with his wife, Anna, is one of them; their love is a piece that holds throughout the entire story. His friendship with Friedrich Zimmel is another. This is what it means to live in a historically significant time – hindsight is what gives it significance. When Josef is busy with his life, his wife, his son, and their friends, what do Germany’s problems mean to them? It does not stay that way; it can’t. The Anschluss makes it impossible. This is where Friedrich’s position becomes complicated. He joins the Party, allows his company to fire all the Jewish workers, yet finds work for Josef, and later for his relative. He helps Josef’s wife and son escape to China and hides Josef in his house while he’s too ill to travel. He toes the Party line, but helps Josef escape to New York. Later in the war, he keeps Josef’s cousin hidden in his attic – but this too is a complicated situation, and not what it seems. It is years later that these tangled threads come back together in Vienna, as first Josef, and later his surviving family, makes their way back to Vienna, to face what has happened in their absence. Friedrich is guilty as a Party member, and now it is Josef’s word that keeps him safe, absolves him of his crimes. But Josef is not yet fully aware of everything that has happened. And the truth of what happened during the war is not something Friedrich can live with, not without confessing all to Josef first. And while Josef may not know what has happened, he knows it was terrible, and knows he himself bears some responsibility, and is not sure he wants to confront his friend. Some things cannot be put off forever. If I quoted every part that struck me as lovely or thought provoking, over half the book would be written down. It was a good story, sad, but rather slow. Felt like there could have been more to it, so much going on in the world during that time but not much of that was really brought into the story. And so much outside the main characters personal ramblings was left with no real answers. Something about the writing style bothered me in a kind of ocd way at times it felt so fractured and all over the place, but the way the story is told I understand that's part of the intent (just was'nt a fan). That was fascinating. There are tense switches that would be ill advised under a different writer but it works very well here. Josef is a character possessing an integrity and forgiveness that seems boundless. This is a very tender, quiet, and engrossing read. Historical fiction fans take note! A beautifully written novel. The story winds in and out of time and requires careful concentration. Very nice. This is a beautiful book. Tender, insightful, deeply human, and deeply felt - I loved it. An absolutely stunning novel. I did not have any real expectations when I picked this novel up other than the author was Canadian and it was set in Vienna. Since traveling through Europe last summer I have made it a goal to read various books based on places I visited-I could imagine the people and places mentioned so vividly-astonishing. It struck me as I travelled that the ghosts of the past still speak to those who will listen. I will look forward to reading more from Ms. Morrill. Such a beautifully written book! Many lines read like poetry. I was deeply moved by the story and characters. It was believable, heartbreaking, hopeful, beautiful, spiritual, and evocative - difficult to put down! Very much looking forward to more from this author. Josef Tobak is a serene, gentle man living with his wife and son in his beloved Austria. He tends the Jewish Cemeteries of Vienna, where he lives. Then in 1938, he is forced to send is wife and son, to China for safety, with the help of his closest friend Frederich. Frederich is a Gentile and has joined the Nazi party and yet helps Josef to escape to America, once his health permits. After the war Josef returns to Vienna and is also reunited with his wife and son. They all have to learn to know e Josef Tobak is a serene, gentle man living with his wife and son in his beloved Austria. He tends the Jewish Cemeteries of Vienna, where he lives. Then in 1938, he is forced to send is wife and son, to China for safety, with the help of his closest friend Frederich. Frederich is a Gentile and has joined the Nazi party and yet helps Josef to escape to America, once his health permits. At first I didn't want to keep reading- it was one of those books that makes you feel like you've started in the middle of the story and you'll never get to keep up. Several more pages in and my eyes had widened at secrets revealed by the narrator, the language sometimes abstract and image-heavy and sometimes so sharp and piercing it hurts. The secrets were the piercing kind. It kind of made me hold my breath, the entire time I was in the book. Read it. But read it when you've got time to yourse At first I didn't want to keep reading- it was one of those books that makes you feel like you've started in the middle of the story and you'll never get to keep up. I liked reading this book but that would be it. I thought the set up was very interesting but the story lacked real drama or any very propelling plot points. Other than the main character, I felt I didn't understand anyone else in the story or their why's. Also, the cemeteries of Vienna, which were the hook that made me pick this book up, were barely a setting which made me disappointed. I found the book hard to get into. The main character of the book is sometimes talking in the first person and sometimes is written about in the third person. The story takes place during World War II and after and follows 2 friends: one a Jewish man and the other a Nazi official who aids his Jewish friend and family to survive the war. (4.5 stars) This was different from most WWII novels in that most of plot occurs before or after the war, yet the war looms large. There was a bit of an unconventional writing style that worked well instead of seeming too cute. The story of Josef Tobak, living in Vienna as a Jewish boy during the Nazi take over and how his friend helps him, struggling with his own demons over time. The narrative slips from the present to the past as Josef reveals what happens to his family. Everyone on line was raving about this book, but I just managed to get through it. I didn't really enjoy it, but I was determined to make it through. I loved the story...I just didn't like the way it was written...often switching back and forth from first to third person. Although I found this story quite hard to get into (I had to read quite a few pages in before anything began to make sense....found that the author would go off on too many routes but...then...finally!) The story became a wonderful, engrossing read. A solid 4.5 stars read for me! Another incredible story from the WWII, another great history lesson! A subtle , beautiful and haunting story. An incredibly moving tale of the power of art and the enduring power of love. A beautiful book from a talented new voice. I'm looking forward to more from this author!